to be true, even though I did not feel it. It hung in my old house as a reminder of what would come. and was honestly too broken to even look at it. Off to the attic it went. in the playhouse we were building for Halley. Guess what was the exact size I needed to replace what was broken? Just like God repaired what was broken in my own life. Yesterday I read the happiest/ saddest news. This verse immediately came to my mind. Pray for the Macs and the journey they have in front of them. They will sing songs of joy again soon. thanks for sharing the news about the macs!!! also for continuing to share your journey with us all. i am truly touched by it all. What a fantastic verse. Thank you so much for sharing it with us-- and your precious craft! 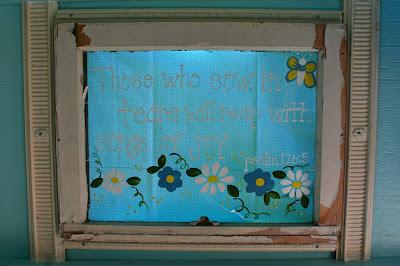 I think that is a beautiful verse, and the painting is so lovely. This is a really uplifting post, thank you! I'm not familiar with that verse, but I love it. A promise of joy: God is so good to us! they do have a long road ahead...but it looking towards joy again. and they have some smiles again. it's awesome. I instantly burst into tears when I read their news too. And then my mind went to you. You are such a living example! What a beautiful verse. I will have to remember that one. I'm so glad you shared this. It touched my heart. What a beautiful post, window and sentiment. Thank you for sharing it with us.